Story (from IMDB) : A recently slain cop joins a team of undead police officers working for the Rest in Peace Department and tries to find the man who murdered him. RIPD is a film with so much potential which will sadly go down as the biggest flop for a comic book movie all year as well as a flop overall. The story revolves around Nick who after getting killed during a police raid is recruited by the RIPD (Rest In Peace Department) to help them rid the earth of the deados that roam in with the living. Once Nick joins the force he meets his rough veteran partner Roy and are soon in the middle of a case trying to figure out why Nick was killed while also helping stop the destruction of the world. It never gets too deep or complicated storywise and pretty much makes it where you can expect what is going to happen next. Thankfully the pace moves at a steady pace and is never too slow. Unfortunately what almost kills the movie is the writing. There is so much banter, one liners, and jokes that are attempted but rarely go through. Occasionally there will be a joke that is funny but for the most part what you end getting is jokes that ultimately don’t deliver. Action wise the film does a entertaining job with some decent special effects. The deados look okay but most of them don’t look like anything you haven’t seen before. You have one that is fat, ones with cracks, ones with tentacles, etc. They explode into colored air and that’s it for them. As with any action movie you have the car chases and foot chases thrown in for good mix. The car chase isn’t the best seen but in a generic movie like this it is at least watchable. With the bad writing though the big loss is the cast. 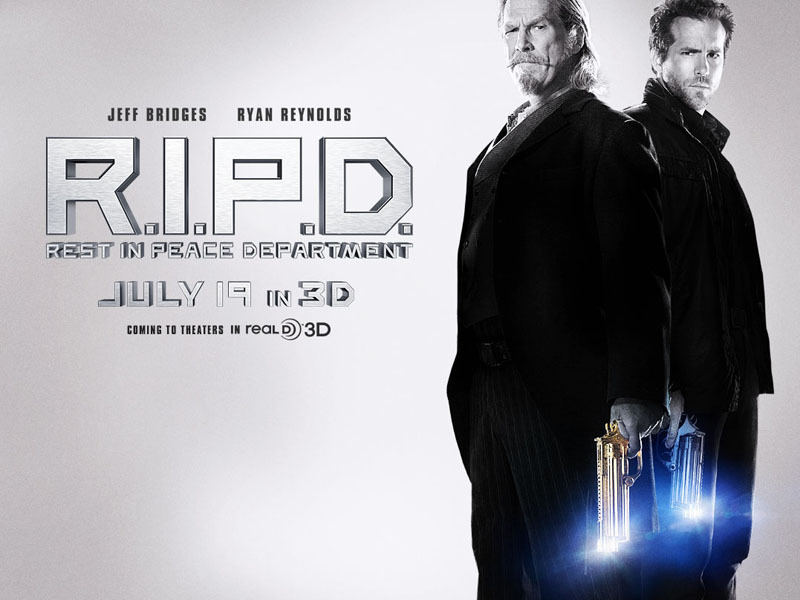 Ryan Reynolds and Jeff Bridges have good on screen chemistry and given a decent script could have been better. Reynolds is playing the same role as the straight talking guy while Jeff Bridges playing the crazy veteran cop with a life back in the old time west. Mary-Louise Parker plays the recruiter / boss to Nick and Roy. While her character has a dry sense of humor that often works I feel like her character never did much and was sometimes used too much or not enough. They also tried tacking on more story to her that ultimately did little to nothing for the story overall. Kevin Bacon though as always is great. He can play a dirty cop to a perfection, again though if given better writing it would of been much better for him. Overall we end up with a story that does enough to push forward, generic action, a good cast, but horrible writing. Maybe down they line they will reboot this series and try again because what we end up with a below average comic book / action / sci-fi film. It you truly want to see it wait till it comes out on DVD.